Isla Mujeres sign near the ferry dock. 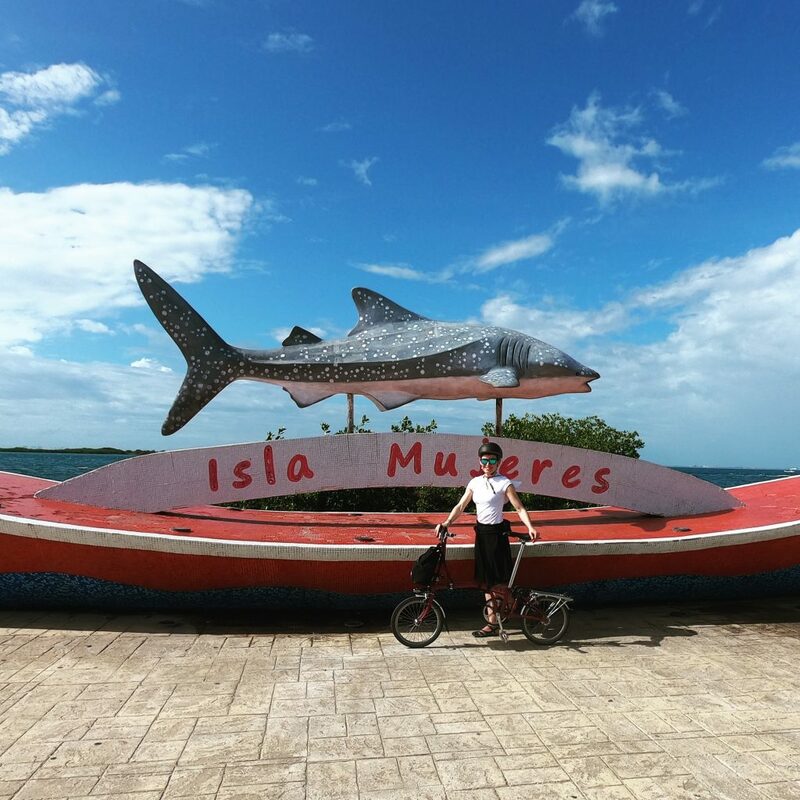 Isla Mujeres is a lovely change from cycling around Cancun. There are few cars and no buses; the roads are used mainly by mopeds (ridden by both locals and tourists). Mopeds and motorbikes are definitely the transportation mode of choice outside the big cities on the Yucatan peninsula. 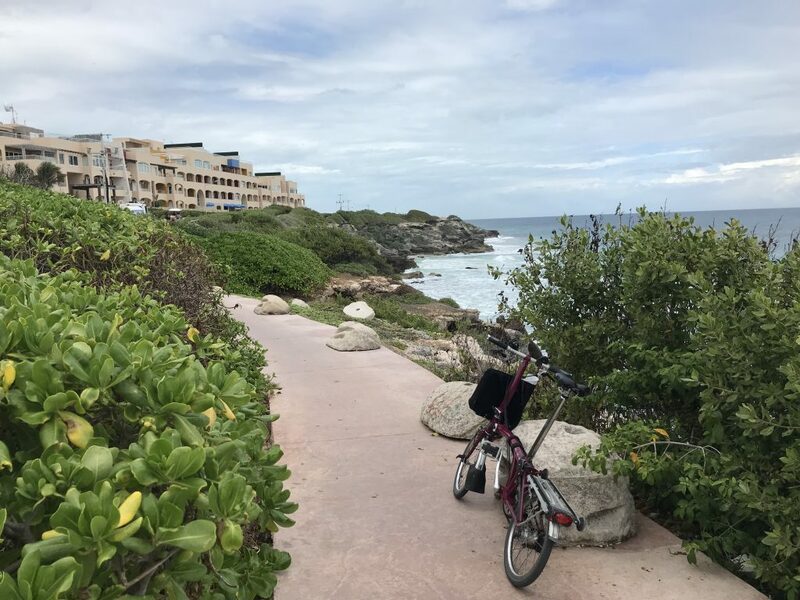 We decided to bike south to Punta Sur along the west side of the island, though we skipped the Aquarium and Dolphin Discovery sites. 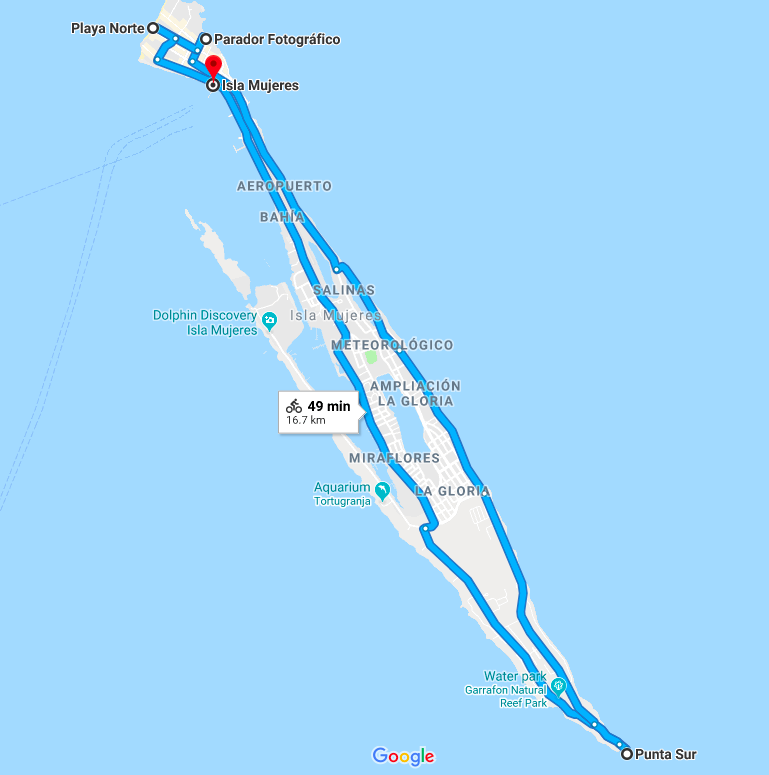 In hindsight, we’d do this ride in the opposite direction, starting on the east side, going down to Punta Sur and coming back up on the west side so, if we had time, we could opt to ride the extra kilometres to check out dolphins. The road that travels down the west side (not counting the spit where the dolphins are) isn’t the most scenic. As you can see on the map, it’s a bit inland, so there are no coastal views. 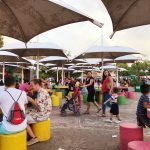 However, if you’re looking to stop for snacks or water or sunscreen, there are lots of places to do that, including a huge Walmart. 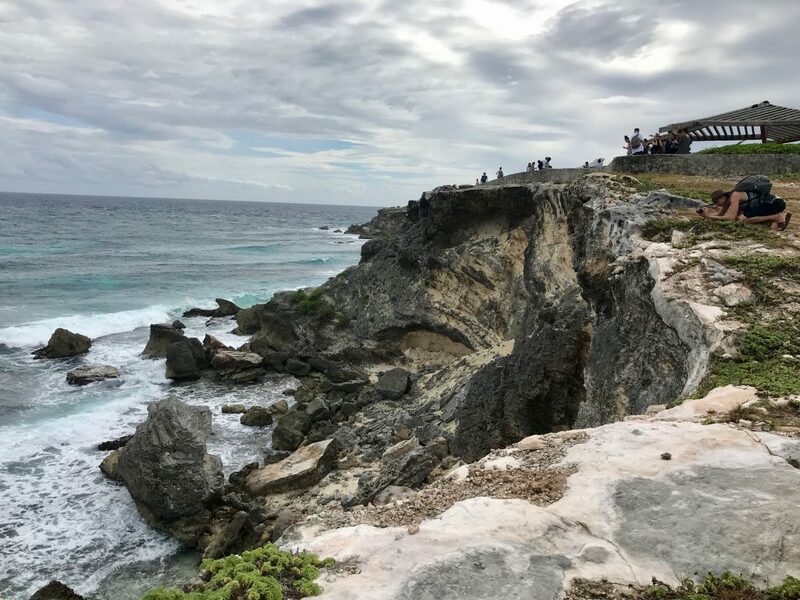 We stopped at the lookout point just off the road to see Garrafon Reef Park, but it was a windy day and thunderstorms were looming, so we didn’t go snorkelling. Then we got back on our bikes and in five minutes arrived at the southernmost point of the island, Punta Sur. 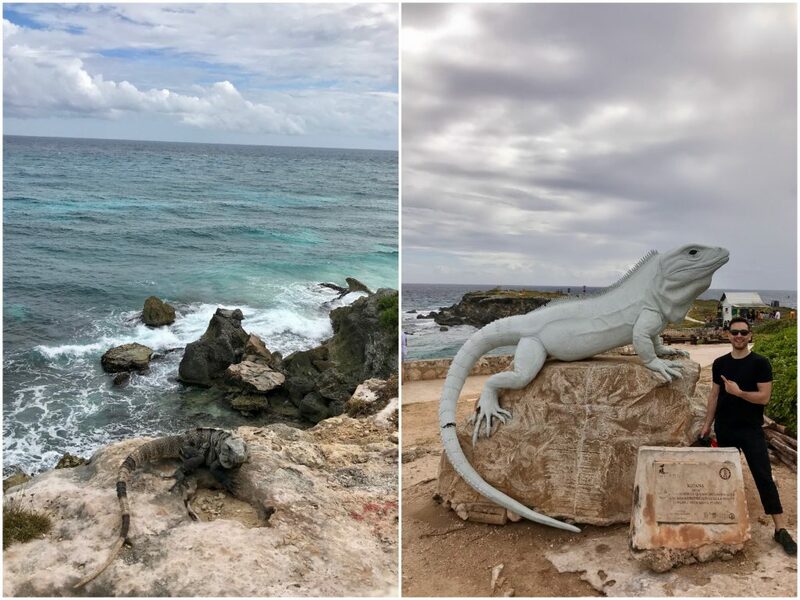 Apparently Punta Sur is known for its iguanas. 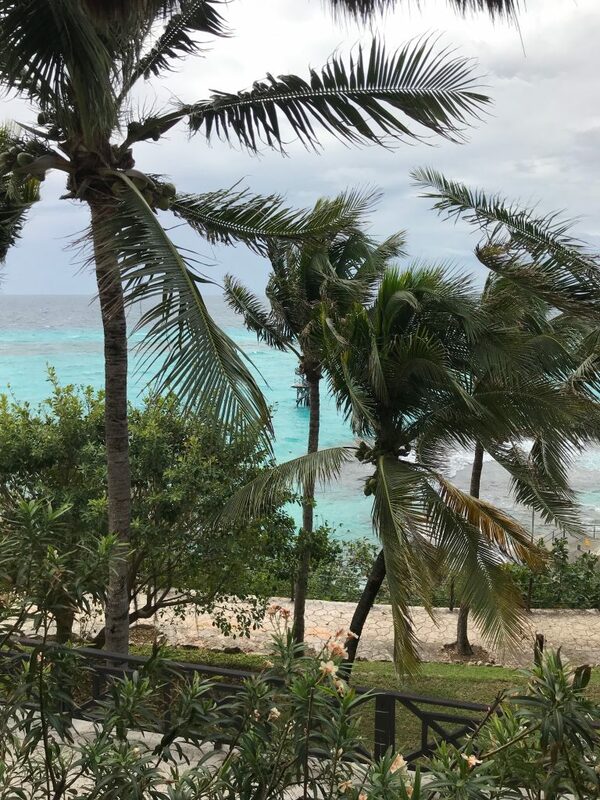 There’s a bar and restaurant at Punta Sur if you feel like staying here longer. But we were ready to hit the road – the one along the east side of the island. This is not the swimming coast (apparently the current and waves and rocks make it all very dangerous), but it is definitely the most scenic — as you can see in our VIDEO at the end of this post. For pretty much the whole ride, we could see the water. And there are beautiful lookout points and paths to stop and explore. Path along east coast of Isla Mujeres. Back in town, we headed to Playa Norte. 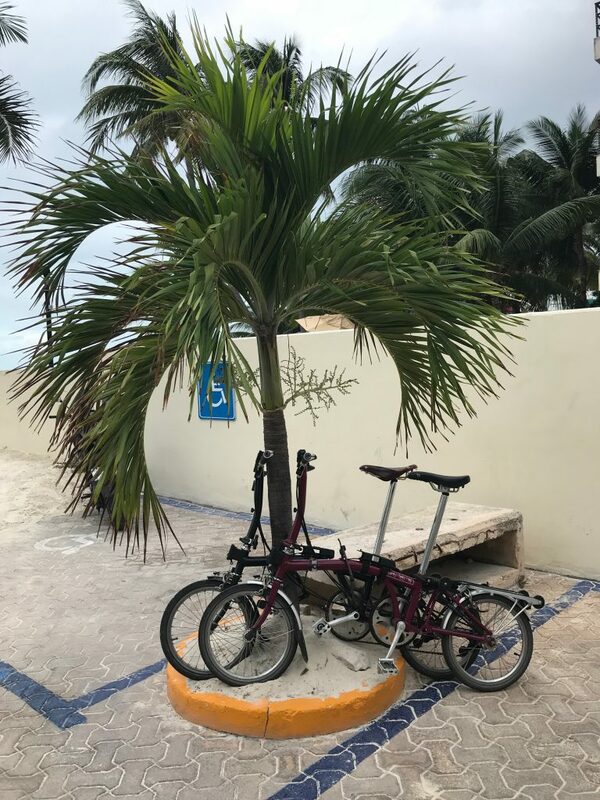 There was no bike parking in sight, so we carefully locked our bikes to a palm tree. At the beach, Pier had a quick swim, and then we had a drink and waited out the thunderstorm from under the big bar/food gazebo type thing. After, we toured around the town proper and explored a bit more before heading back to Cancun. All in all, Isla Mujeres is very chill. 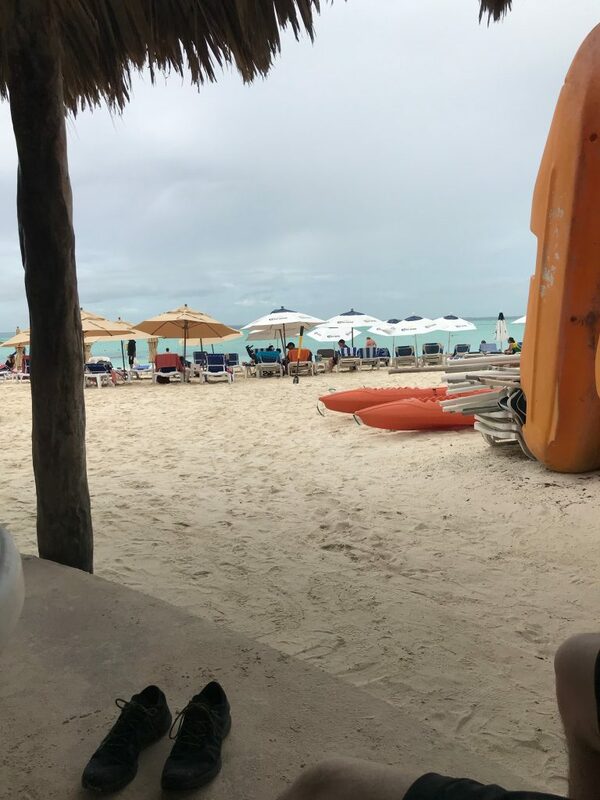 If you’re not into the hustle and traffic in Cancun, we’d recommend staying on the island so you can really relax and enjoy it. 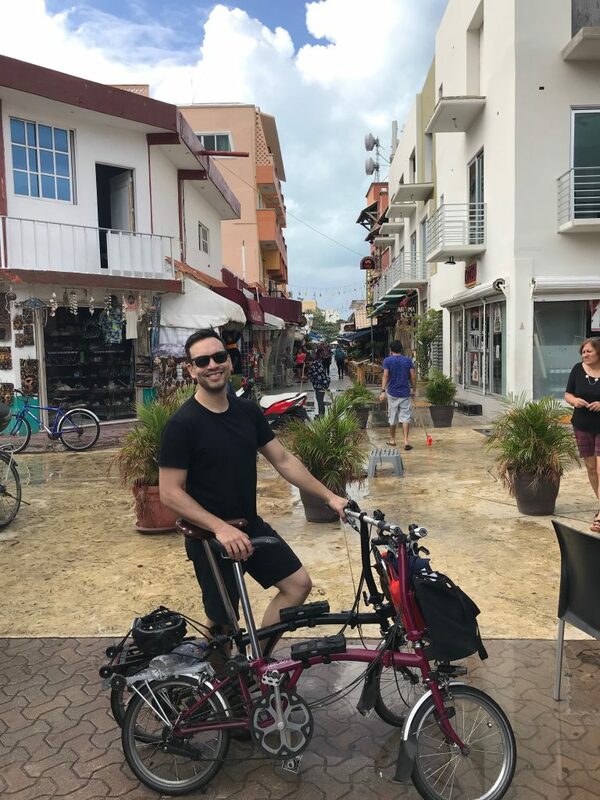 In hindsight, that’s what we’d do — get a hotel on Isla Mujeres and bike around to the sites over a couple days.